This is a long retired blue stem edition. 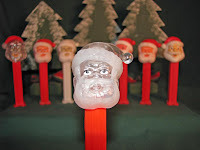 A CRYSTAL CLEAR CLEAR SANTA "D"
This is not to be confused with the special Target edition issued in 2008 (see 3rd Day of Pez-mas) which has a red cap. This is a very rare, special, special edition for a rare, special, special girl. 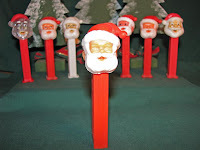 And so ends our 12 days of PEZ-MAS with jolly Santa. I guess we did start a day or so early. 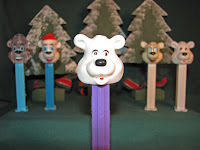 But who wants to think about Pez-mas on CHRISTMAS EVE or CHRISTMAS DAY? There are much more fun things on which to focus then (for some people). 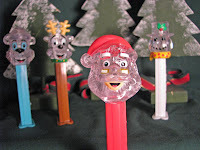 A CRYSTAL CLEAR SANTA "C"
This is a rare special edition PEZ - just like Rachel. 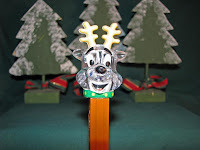 This is a Santa C, which in the early versions came out, with unpainted eyes and thus became known as "blind". May Jeff continue to keep his eyes open in his quest. 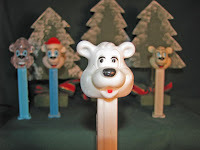 This is a later variation to the original white-stem Icee Bear to complete a momma & poppa bear set. This is a vintage, white stem issue, not be confused with the POLAR BEAR w/o CAP. This goes to the Dad of the up-north Andersons. 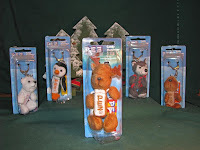 Since Elizabeth likes cuddly things she gets this 2007 addition to the Winter Furry Friends keychain set. 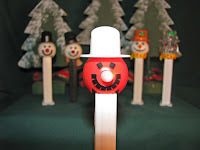 This is a special edition misfit old style/Snowman "A". It's for Jason having just returned from 'Bahama' with a suntan to shoveling snow at home in Kansas. 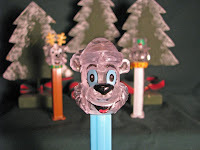 This forms the complete special edition 2009 Christmas set of crystal clears. This goes to Mom - the greatest Mrs. Santa. 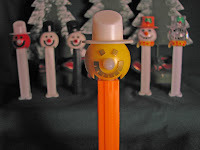 The Mrs. Santa Pez was retired last year so we have added this to the collection to go with the contemporary Christmas set.